Are Screens and Keyboards Obsolete? 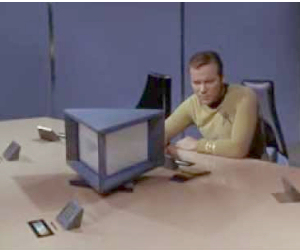 Captain Kirk talked to his computer in many Star Trek episodes, and it answered him by talking back. No screen was needed. Once again, life is imitating art. Devices such as the Amazon Echo, Google Home, and your smartphone can now do much the same, and perhaps even better. Wired magazine argues that “The Amazon Echo Is Winning the Race to a Screenless Future”. The author, Davey Alba, invokes cloud computing, artifiicial intelligence, machine learning, and other mysterious geekery. But his bottom line is: people like talking with their computers more than reading or writing with them. It turns out that the “screenless future” is also a keyboard-less future, and mice are extinct, too. The featureless, Platonic cylinder of Amazon’s Echo, powered by cloud-borne Alexa software, is one manifestation of this future. But there are many others, and many dramatic changes in the offing for consumers. I will be first to admit that I like talking with my smartphone and being understood by it. Voice recognition has made huge leaps in the past few years. Only 5 years ago, the only game in town for desktop PCs was Dragon Naturally Speaking from Nuance. It was difficult to use, you had to train it to recognize your voice, and it didn't work with all your apps. Now I talk to my phone all the time. It's so much easier to dictate a text message or email on my phone than by typing on a virtual keyboard. Accuracy is shockingly good, even in fairly noisy environments. I can tell my phone to "take a memo" or "set an alarm" even when it's in my pocket. Who needs screens or keypads when Siri and Google Now are compliant, voice-activated servants? The downside is that I sometimes appear to be barking mad. “Look, there’s another poor guy talking to himself!” The visual cues that I am “on the phone” are often completely eliminated, resulting in awkward interruptions and strange looks. Captain Kirk never had any such misgivings about conversing with his computer. More than two-thirds of Americans own smartphones, according industry observers. Many of them use their phones much like I do, in hands-free natural conversations. The “screenless future” is made possible by the practice that consumers are getting on their phones. But it includes far more than phones, indeed far more than discretely identifiable objects. The “Internet of Things,” or IoT, is most definitely coming; some would argue that it’s already here in force. (See my related article The Internet of Insecure Things.) Like an iceberg, only a small fraction of the IoT is easily seen. So-called “embedded systems” are hidden inside of mundane objects like refrigerators and cars. Many more embedded systems are in objects that ordinary citizens rarely see, like electrical utility stations, traffic control systems, and the omnipresent surveillance camera networks. A refrigerator with a touchscreen is rather awkward and unsightly. Voice interaction is the obvious ideal, like the “replicator” in the Starship Enterprise’s galley. “Earl Grey, hot,” anyone? Google already has prototype driverless cars that lack a steering wheel and pedals, and whose screens are mainly for entertainment rather than guidance and control. And, of course, there’s Amazon Echo and upcoming attempts to catch up with it, such as Google Home. “Wearable tech” is another fertile field for “screenlessness.” My shirts should just change color when I discreetly mutter, “Change color to blue,” and they should know my favorite shade of blue. My phone should not be in my pocket; instead, perhaps my pocket should be my phone! I am calling the “screenless future” a meme because the concept is a powerful one that is likely to reshape our society. It is an idea which captures the imaginations of consumers while inspiring artists, industrial designers, and makers of all kinds. It’s not the debased definition of “meme” that is just a pun in the form of a GIF. This meme matters. Most recent comments on "[MEME] The Screenless Future?" I still find myself wanting to be tactile, and I don't mean touchscreen. I'm concerned that the voice recognition won't completely understand me and would I have to dictate numbers to use a calculator? Robert Lee, voice recognition software will allow you to do numbers. It does not take away your ability to use your mouse. So you will have a choice to use voice recognition and your mouse. All you're actually doing is dictating, if you make a mistake, there is a voice command " scratch that " which allows you to remove any and all mistakes. Hope that gives you an idea of what you're looking at. No screen and no keyboard for Excel spreadsheets? If you're not going to look at it, why bother with the spreadsheet at all? Ditto for PowerPoint presentations. And internet banking and other financial transactions online? Nah... I think we'll still have screens and keyboards for a good, long time. Well, until us old-timers die off, anyway. I started using Dragon Natural Speaking in the 90ties and I liked it from the very beginning. It makes it much easier to write articles, longer email or even a book. However, human beings are focused on what they see like nicely arranged food or a beautiful woman/man. Therefore I don't want to miss a screen. Beside that a mice makes life easy and is much better than a touch pad. I don't like to miss these. The one issue I have with talking and listening to your phone, tablet or computer is privacy and courtesy in public places. I can now verbally query my IPhone, but often choose to type in my queries when I am in a public place because I don't want people to know what I am working on. And if I am in a meeting or lecture, I don't want to disturb the speakers and want to work quietly. That said, I use the voice query function whenever I feel comfortable doing so. No "smart" phones for me thanks. I see way too many people doing something on their smart phone not paying attention to what is going on around them at all. The world can be a dangerous place physically and financially. Privacy has become virtually extinct anymore. Why should we share our thoughts and feelings with total strangers by ignoring them? This doesn't mean they are ignoring us. There are a lot of predators out there folks. They watch for people not paying attention to things. What about the Deaf community? We rely on visual aids to function. Taking that away and going screenless will severely and basically leave us all in the dust. Absolutely hate dictating to my smartphone which is a Samsung Galaxy 5. I either have to speak so slowly that it takes forever or I am left to make so many corrections to the text that I could have typed it faster in the first place. Maybe voice recognition will improve but on this phone, it isn't good. I don't have a mobile phone, smart or otherwise. I don't have a speaker on my computer. I tried Dragon in the 90s and again in the noughties - couldn't get on with it. Our landline still works and is way cheaper (VOIP). Herself makes me take her smart thingie with me when I am in danger of being needed - hasn't worked out that I don't know how it works since she upgraded. Like Clyde, I am deaf. If you take my screen away you take computers away from me. I am another old geezer hanging on by a thread but I am still here and still trying to learn. No screen, no more e-books, even less learning. I certainly hope they are around for some of us at leaat. I would complain about no one caring about the handicapped but the govenmeat ruled being deaf is not a "handicap". We need both voice and visual. My hat is off to the blind that can work computers and I am all for anything that will help them so I do hope they keep making voice better. Imagine listening to all them ads first before getting the weather! What gets me is the phrase "Everybody....." Not everybody is going to be able to afford these wonderful new toys. (New "toys" do come with hefty price tags--at least for folks in my financial situation.) This "voice" business might be just what visually impaired people need but it sure as heck isn't what we hearing-impaired folks need. Damn, I'm glad I'm old and won't be around when all the new "toys" get forced upon us. Thanks for the "heads-up" but: "No Thanks" to the concepts. It bugs the hell out of me that so many people force their conversations on me because of their damned cell phones. Not for me. At least it would make it more likely that drivers would be watching the road and not the keypad. When I was loading groceries into the car, the woman next to me was already on her phone even while she was trying to back her car out. I invested several dozen hours on three versions of Dragon NS; first in 1999 and most recently 6 years ago. They were expensive mistakes. The only thing I can think of is that having spent 16 years in Scotland, 4 years in Germany, 15 months in England, the rest in the US and being multilingual, my voice/accent simply varies too much too often for the software to recognize. Another way I know this is that negotiating with the VRU's of large corporations is excruciating in the extreme: my success rate is about 5%. Cortana is another disaster: I've turned it off and I have no intention of buying an iPhone. My experience tells me this technology has quite a bit further to go in terms of development before it will be as ubiquitous as you foresee. Additionally, I will never give up my flat panel screens although I would be happy to add a holo screen and you will only get my mouse and stylus by prying them from my cold, dead hands. Regardless, I always enjoy your posts. Sending thanks & best wishes! I'm certainly no techno-nit-picker, as programming and troubleshooting have always come easy to me and provided an excellent income. I simply find this facet of technology to be more of an annoying waste of my time, at this point in it's evolution. I guess I'll stay an old fuddy-duddy and stick with typing on a keyboard and using a mouse. I can understand that there could be many applications for these new fangled items for some people with disabilities or other situations that need them. My thing is that when my bride and I go out to dinner, I see people sitting across from each other, not talking, but using their phones to text. What's going to happen when we're blinded by these items? Using "scratch that" to accomplish error correction would hardly work. Scratch what, exactly? The last one word? the last phrase? the last sentence? No set of standardized voice cues for "go-back-to" would substitute for glancing up and down the text to find & review what you think may need rewording. Whether making a series of points... or giving detailed instructions...or explaining one's position on an issue, you need to review from various places in the text before you feel it's OK to "send". Trying to do that without a screen (or a printout) would require you to have memorized the paragraphs you dictated so far. It is similarly important when reading through difficult material written by others. Granted, screenless methods will be useful for giving simple commands to physical machines, or to accommodate disabilities. However, the only normal "communication" a screenless world would be adequate for is the kind that has been increasingly conducted in 140 characters or less. What the world needs now is better comprehension and clarity, not faster or more effortless ways to communicate tidbits. We need better reasoning, not thoughtless comments that "shame" others based on snippets of false facts, or that tell the whole world what you ate for lunch. We can already see the effect that nano-dialogue has on our culture in everyone from little kids to Internet trolls (and presidential candidates). You don´t mention activities where this will never happen. Artists would have to go back to traditional paper and canvas, draftmen would have to go back to the drawing board and vellum, the news would be imageless, ect. Would you surf the web to buy a product which will only be described verbally? A lot of activities do not need a screen, others will always need one. Your fridge will tell you what you need to buy and you take note in a paper? Wonderful. No no, using wi-fi will transfer to your screen-less phone and there you go to buy. Ah!, and when I'm there the phone will tell me a hundred times what is in the list till I find everything I need. I hope it will be in order or I'll go across the market store a hundred times: now I need some soda, now I need some bread, now I need carrots, now I need rice, now tomatoes (weren't them near de the carrots? in a list I would have ordered them If I could see it). And will these marvelous devices be able to explain me the design of my next house using words? Better show me a nice picture (oh, damn, there is no screen).